A traditional risotto, scaled for one. It’s no secret that I love risotto (Exhibit A, Exhibit B). It can be a time-intensive dish, so my tendency has always been to make risotto in bulk. But after a few delicious risotto meals recently, I realized I didn’t have enough ingredients left to make any of my favorite risotto recipes without buying more supplies. The idea of risotto for one was born. 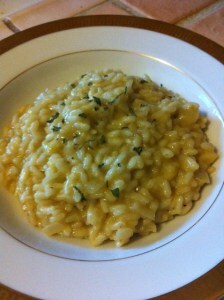 I scoured several risotto recipes for larger groups and tweaked them to fit my ingredient supply. This risotto is deliciously simple and just the right size for one. Enjoy! Warm the stock in a pot over medium heat.